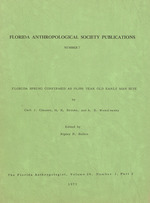 Florida Anthropological Society Publications: Number 7. Room 102, Florida State Museum, University of Florida, Gainesville, FL 32611.
items to the president. Second class postage paid at Gainesville, Florida. the 1959 Warm Mineral Springs specimens have been viewed with some skepticism. water technicians of the Florida Bureau of Historic Sites and Properties. material indicate are approximately 10,000 years old. the present ground surface gave rise to the large vertical shaft. fissures are found primarily on the northeast and southwest sides of the spring. skeletal remains described in this report were found in this deposit (Fig. 2). were covered with a feathery tufa crust composed of calcite up to 0. 10 m thick. extends into the Suwannee and Ocala limestones. the upper two-thirds of the water column. looking northwest. Includes some recent extensive changes. stream from the U. S, Highway 41 bridge over the river. as a health spa by the owners, the Warm Mineral Springs Corporation. occasionally found in this layer. years B. P. or 6570 B. C. (W-1241). 9,870 370 years B. P. or 7920 B, C, (W-1153), from top to bottom respectively. depth of 12 m and outer portion of 13 m ledge at 17 to 20 m depth. or algal organisms in the spring waters (Breder 1957:132-135). than now must have occasionally prevailed during deposition of the two lower zones. wall encrustation subaqueously and occasionally as dripstone growths. in greater detail further along in this section and later in the conclusion. overlaid by a massive growth of tufa weighing an estimated 150 to 200 kilos. close examination of the sedimentary profile. At this point the leaf bed (Fig. bands of terrestrial plant debris and calcareous sediments (tufa and marl). gray-green clay from the country rock. 6970 B. Co (Gak-3992) for the top sample, 9,350 190 years B. P. or 7400 B. C.
(Gak-3993) for the middle sample, and 9,220 180 years B. P. or 7270 B. C.
(Gak-3991) for the stratigraphically lowest sample. into the gray-green clay below. the test from the side nearest the center of the spring rather than from above. materials in levels as indicated. discussed later in this report. sacks and identified by level. botanical or faunal remains were not encountered in excavating Levels 6 and 7.
area to lower left is the drop-off into greater depths. Florida Department of State, for storage and analysis. University radiocarbon laboratory with the control samples previously mentioned. sure that any antique carbonate compounds they might contain would be purged. Results (GAK-3995/6/7/8/9) for the five levels have been plotted in Figure 7b. 10,000 years old (Fib. 7b). on top of a lower former surface at the Zone 3 sediment. permanently identified with a large nail, 15 cm long, driven into the limestone. of the test were also left in place. front of Clausen's lowered head. cular surface of the iliac fragment described below. tite just to the right of the upper part of the scale. undulating appearance of a synchondrosis, with no evidence of synotosis. that both the vertebra and the innominate fragment are from a single individual. apparent differences between these bones and those of modern children. claim made by Royal and Clark that the spring contains 10,000-year-old remains. vided in "The Earliest Americans" by C. Vance Haynes Jr. (1969), in Science. of the Mississippi River, or even perhaps so far discovered in North America. range at the University of Texas in Austin included for comparative purposes. and then follow with possible explanations for the human bones in the deposit. the central debris cone some 25 to 32 m deeper in the spring. depth of water over these sediments was probably at least 1 to 1.5 m.
was nowhere discernible in the Zone 3 sediments. that materials settling on it slide off, falling into the central depths of the spring. surface (7. 5 to 11 m below MSL). ate precipitation occur, and that the dark leafy strata reflect average, or "normal"
the spring flowed briefly, filling the cavity with connate waters. vertebrates (frogs and mice) in the Zone 2 sediments supports this interpretation. m below present spring surface (5-8 m below MSL) by that period. sub-aerial spalling from the exposed spring walls under the ledge occurred. of Zone 2 dated at 8,500 years B. P.
sacrificed for radiocarbon assay and returned a date of 9,645 160 years B. P.
potentiometric water level similar to that existing at present, began to flow. higher potentiometric level in the Floridan artesian system. we view these theories, particularly the former, as improbable explanations. caves" in the spring "when the sea level was considerably lower than at present"
of that feature. The ledge is more like a rock shelter than a real cave. food) they would have to be "great alpinists. " material culture of the period. to the surface in November 1972) . indicating this concentration of bones represented a burial were observed. easily from the test area. Salt Spring, 8S0I8 (mentioned earlier), contains large quantities of human bone. with a large number of preceramic burials (A. K. Bullen 1972:166). Devil's Den, 8Lv44, in Levy County some 280 km north of Warm Mineral Springs. vation of these sediments is approximately 12-15 m above present MSL. Fig. 12. Photomosaic of profile of northeast face of Test 2 at Little Salt Spring. 5,500 to 5,000 years ago. mouth of the cave (Clausen 1964b). years B.P. or 5025 B. C. (Gx-0637) and 7,045 1 85 years B P. or 5095 B. C.
(Brooks 1973:558-559; Gleason, Cohen and Brooks 1974:309-311). the only dependable sources of water for tens of kilometers in any direction. with little chance of escape. in elevations were not too great) to retrieve drowned or subdued animals. the ledges which also exist at Little Salt Spring in order to set up housekeeping. line to the edge of the drop-off, unassisted, would be no small accomplishment. extremely wide range of both extinct and extant vertebrate species were encountered. in substantial numbers in the case of the smaller vertebrates. finally would be incorporated in the sediments. Tunnell, Texas State Archeaologist, personal communication) and Alabama (L.
Ross Morrell, Florida State Archaeologist, personal communication). to settle on the ledge. separated in time of origin by almost 5,000 years, are now mixed. of Jewell (1961) that archaeology in submerged fresh-water sites is feasible. characterized the last few decades. perhaps tens of thousands, of years. edited by Richard B. Lee and Irven DeVore, pp. 229-240. Copeia, No. 2, pp. 132-135. Baltimore. Vol. 5, No. 7, pp. 558-559. Dallas. vised edition. Kendall Books. Gainesville. 1964a The A-356 site and the Florida Archaic. Unpublished M.A. of Archives and History Newsletter, Vol. 3, No. 2. Tallahassee. the Society for American Archaeology, Bal Harbour, Florida. 1971-72, in possession of the authors. meeting of the Society for American Archeology, Dallas. 1962 Warm Mineral Springs, Bayplay Magazine, January 1962. Tampa. Florida: Present and Past, Memoir 2, edited by Patrick J.
Gleason. Miami Geological Society. Miami. Antiquity, Vol. 25, No. 3, pp. 348-354.
the Southeastern Archeological Conference Vol. 8, pp. 77-88. National Park Service, U. S. Department of the Interior. Washington. 1969 The earliest Americans. Science, Vol. 166, pp. 709-715. Publications in Anthropology No. 44. New Haven. Florida. American Antiquity, Vol. 26, No. 2, pp. 285-287. Museum, Harvard University, Vols. 11, 12. Cambridge. 1944 Myakka River quadrangle 7. 5 minute topographic map. Yezdani, G. Habib, and E. S. Deevey Jr.
31 pp. 2 figs. 4 pi. 1949. Out of print. Ripley P. Bullen, 42 pp. 2 figs. 4 pis. I960. Out of print. 48 pp. 6 figs. 7 pis. 1951. Out of print. 1 plate, 1956. Out of print. 4 summary articles, 18 pp. bibliography, 1958. Out of print. from the Treasurer (see inside front cover).